The white-sand beaches, impressive mountain ranges veined with spectacular rivers and waterfalls, and saltwater lakes teeming with exotic wildlife are just part of the Dominican Republic’s appeal. Whether you’re looking to party, relax or explore, the Dominican Republic has a lot to offer. The Dominican Republic (DR) is a land of contrasts – the physical kind, like the highest peak and the lowest point in the Caribbean, and the more metaphorical kind, like that between the urban street life of Santo Domingo and the rural villages only a short drive away. Santo Domingo, or ‘La Capital’ as it’s typically called, is to Dominicans what New York is to Americans, a collage of cultures; or what Havana is to Cubans, a vibrant beating heart that fuels the entire country. It’s also a living museum, offering the sight of New World firsts scattered around the charming cobblestone streets of the Zona Colonial. The DR is also famous for the large all-inclusive resorts that dominate much of the country’s prime beachfront real estate. However, the result is less like the high-rise congestion of Cancun or Miami and more like low-slung retirement communities, albeit ones populated by families, couples and singles of all ages looking for a hassle-free holiday. Beyond the gated luxury enclaves, the roads lead inland past vast sugar plantations and through small villages. To get away from the get-away, travelers head to the Península de Samaná, where the European vibe is as strong as an espresso, and where escape is the operative word. Cabarete on the North Coast has winds which draw adrenaline junkies from around the world. And for the anti-Caribbean experience head to the popular mountain retreats of Jarabacoa and Constanza – places where bathing suits are out and sweaters are in. Best buys are products made on the island including amber jewelry and decorative pieces. These are a national specialty; some pieces encase insects, leaves or dew drops within the ancient petrified pine resin. Larimar or Dominican turquoise is another popular stone. Milky blue and polished pink pieces of conch shell are also made into jewelry. Rocking chairs, woodcarvings, macramé, pottery, Taino artifacts, Creole dolls, baskets, limestone carvings and CDs of salsa and merengue also make good buys. Bargaining is recommended, and in most cases expected. For scuba-diving and snorkeling enthusiasts, there is reef diving, good visibility, warm waters, wrecks, caverns and a rich marine life. 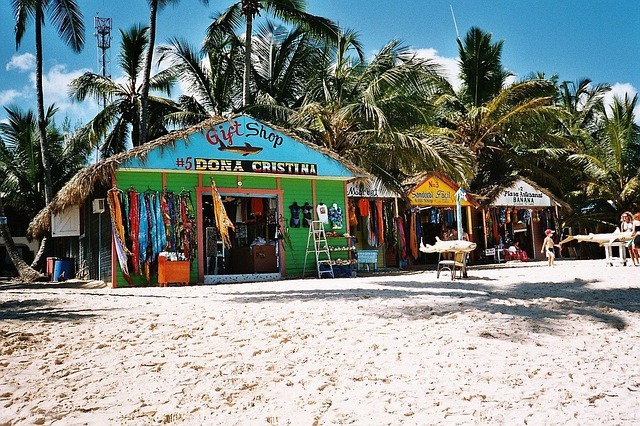 Good dive sites include Sosúa (near Puerto Plata); Cabrera (freshwater cave diving with an underground lake); Las Terrenas; the Samaná peninsula; Punta Rucia(good for coral diving); La Caleta National Underwater Park (accessible by boat from Boca Chica); Catalina and Saona islands(accessible by boat from La Romana); andBarahona (an area currently being developed for ecotourism). Experienced divers can also join the North Caribbean Research Group and participate in a government-funded project to recover and remove artifacts from sunken ships, some dating back to the 16th century. Snorkeling and diving equipment can be borrowed or hired from dive operators and resort hotels. 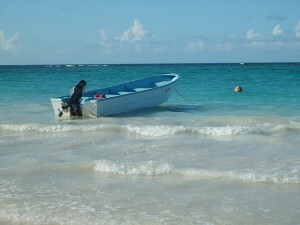 Small sailing craft are available through hotels in Santo Domingo and most other resorts in the country. Boat trips to the marine caves of the Gri Gri Lagoon near Sosúa are a popular tourist attraction. Hotels also organize charter boats for offshore fishing for marlin, sailfish, dorado, benittos and other game fish. River fishing in flat-bottomed boats with guides can be arranged at La Romana, Boca de Yuma and on the north coast. Windsurfing is particularly good at Sosuá, which also hosts the Professional Windsurfing Association World Cup. The main foreign tourist seasons are from December to February, July to August, and Semana Santa (the week before Easter). Expect higher prices and more crowded beaches during these times. Also, note that most water sports and activities are prohibited throughout Semana Santa. The June-to-September hurricane season might be worth missing; though the chances of one blowing through are miniscule, remember that one little hurricane can wreck your whole holiday. All in all, February and November are perhaps the best months to visit – both have great weather, thinner crowds and allow you to partake in either pro baseball, Carnival or whale-watching. The Dominican monetary unit is the peso, indicated by the symbol RD$. There are one- and five-peso coins, while paper money comes in denominations of 10, 20, 50, 100, 500 and 1000 pesos.